2 of 4 Grill bread slices 1 minute per side, until toasted. 3 of 4 Rub one side of each slice with garlic, lightly brush with olive oil and sprinkle with a pinch of sea salt. 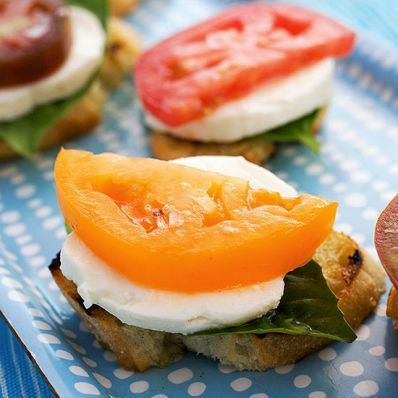 4 of 4 On each bruschetta, place a basil leaf, a slice of cheese and a tomato slice. Drizzle with balsamic vinegar and sprinkle with additional sea salt, if desired. Per Serving: 531 mg sodium, 10 g pro., 1 g fiber, 18 g carb., 5 g sat. fat, 20 mg chol., 9 g Fat, total, 192 kcal cal.